On 12 July, winners of the IOM3 Awards were invited to a ceremony to celebrate their achievements at The Institute of Materials, Minerals and Mining (IOM3) HQ in London. The annual awards recognise both personal triumphs and outstanding contributions of companies within the materials cycle. 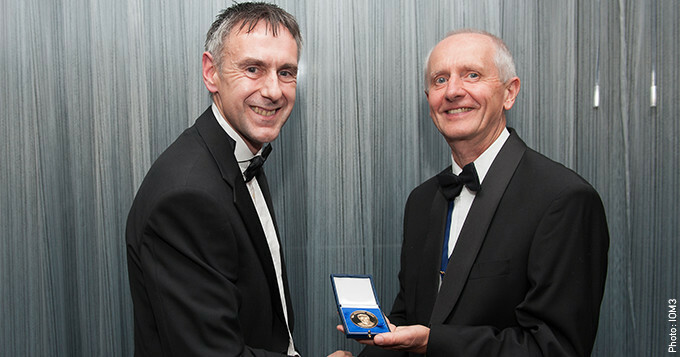 Awards presented on the night included the Chapman Medal, awarded to Dr David Farrar CSci FIMMM. The Chapman Medal is presented for distinguished research in the field of biomedical materials, particularly with respect to biomaterials innovation, which has produced benefits for patients and/or contributed to associated opportunities for industry. Through this award David has been recognised for his achievements in the medical device industry combined with active involvement in the wider scientific community. Read the full description of David’s career achievements at iom3.org/iom3-awards-2016.